Probably the coolest item I saw at the Pepcom press event last night is actually something that’s been out for almost three months now, but has pretty much flown under the radar. It’s called the LiveScribe Pulse Smartpen, and for those of us who frequently take notes (::cough:: me ::cough::), it could make our lives ten times easier. Note-taking can be a tedious process, and even the fastest transcribers can still miss a word. With this little device, that is going to be hard to do. 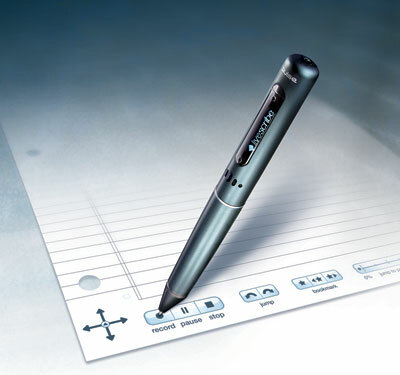 Simply put it is a computer within a pen, which simultaneously captures the handwriting of the user while recording audio. Thus, a user just needs to tap on the portion of the writing where they would like to review the accompanying audio, and the pen knows where it is. The pen is controlled through special paper that has nearly-invisible dots printed across the entire surface. Across the bottom are printed controls, which the user taps to move through the menu system, and to record, play, rewind, fast forward, or speed up and slow down audio. While it sounds proprietary (it is), LiveScribe is opening up the paper design to third-party manufacturers and home users so they can print their own paper. Me talking about it here does not do it much justice, so check out this video provided by the company. I’m warning you now it is really corny, but it gives you the general idea. Once the note-taking process is complete, a user can simply dock the pen and the handwritten notes are uploaded into the LiveScribe application, which then can be searchable by keyword, or like the paper, search through audio based on the location clicked within the notes. What’s even neater is the application environment. The company’s PR people showed me a language application where a word is written out, and then translated (with the text appearing on the device’s screen and spoken from the included speaker). A variety of applications are due soon, including an interactive digital organizer, games, a Bible, and even applications that would help the visual impaired to read. Two capacities are available, a 1GB for $149, and a 2GB at $199. While it seems like a lot to pay for a pen, I think its well worth it. Look at the price of a good digital voice recorder: this one from Sony at Best Buy is $105. Good pens do not come cheap either, so the price seems rather competitive when you look at the features in total. This may be just the journalist in me, but I could have used this last night. Sometimes its difficult to keep up with fast-talking PR folks, especially at events like this. They are trying to talk to as many in the press as possible–so having backup is a good thing. I think I found my Christmas gift this year.